"If I want to get a job, of course no one would hire me," says Russian student Daniil Markin, who has been charged with inciting hate speech. Russia has already convicted a blogger for mocking Christianity with Pokemon Go. Now a Russian student is facing potential prison time for a meme likening Jesus Christ to a character in the massively popular television show Game Of Thrones. Daniil Markin, a 19-year-old film student in the Siberian city of Barnaul, is facing up to five years in prison after being charged with inciting hate speech over several images lampooning Christianity on his account with the Russian social-networking site VKontakte. The charges against Markin, which he publicly revealed this week for the first time, come amid a broadening Russian crackdown on online speech in recent years that rights advocates say is being used to stifle dissent and help law enforcement officials rack up convictions. He disclosed the case after a fellow Barnaul resident, 23-year-old Maria Motuznaya, drew national attention this week by revealing on Twitter that she is facing hate-speech charges for memes on her VKontakte account that authorities say are racist and denigrate religion. According to case materials reviewed by RFE/RL, Markin is accused of "inciting hatred" against religious believers for a series of satirical images on his VKontakte account between December 2013 and January 2017. 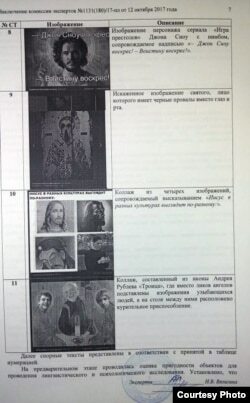 The images cited in the case include a photoshopped version of one of the most famous Russian Orthodox icons, The Trinity, which shows three angels sitting around what appears to be a bong used to smoke marijuana. Another image depicts Jon Snow, a character in the hit HBO show Game Of Thrones, as Jesus Christ and includes the caption "Jon Snow is risen! Truly he is risen!" -- a play on the Russian Orthodox refrain associated with Jesus during Easter celebrations. 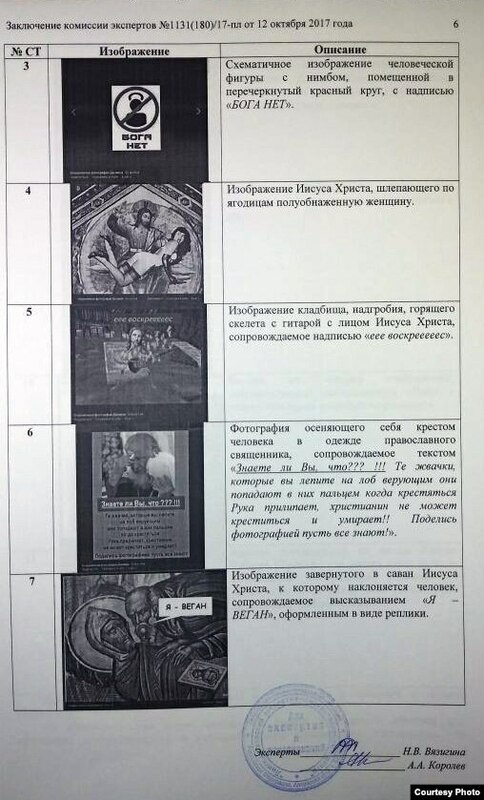 Investigators say Markin posted that image in December 2016 and that it "contains linguistic and psychological elements degrading the human dignity of a group of individuals united by their adherence to Christianity," according to case materials seen by RFE/RL. Markin told RFE/RL that authorities had originally considered charging him under a 2013 law signed by President Vladimir Putin that criminalizes "public actions" aimed at "insulting believers' religious sensibilities" but that they ultimately settled for the hate-speech charges. The most famous such case in Russia is that of Yekaterinburg blogger Ruslan Sokolovsky, who was handed a two-year suspended prison sentence after being convicted last year of hate speech and of insulting religious sensibilities by, among other things, posting the video of himself playing Pokemon Go in a church. Sokolovsky was also convicted of hate speech. Investigators launched the case against Markin in July 2017, raiding his apartment and confiscating his computer and other equipment. Russia’s Federal Financial Monitoring Service has also placed him on its blacklist of "terrorists and extremists," thus preventing him from accessing bank cards and accounts in his name. "On top of that, if I want to get a job, of course no one would hire me," Markin, who works as a graphic designer and photographer to make money while he studies, said by telephone on July 26. "I don’t have any way to use financial resources except cash. That’s a big problem when you need to send someone money." Markin said that after authorities initially brought him in, he signed a protocol stating that he had broken the law with the online posts, a move he says he now regrets. "If I hadn’t done that, they wouldn’t have had anything on me whatsoever," he said. Markin said he quickly dismissed the state-appointed attorney he had been provided. His current lawyer, Aleksandr Yeryomenko, told RFE/RL that he hopes the court will absolve his client due to "lack of evidence of a crime." The next court hearing in Barnaul is set for July 30, Yeryomenko said. Markin said he believes the case has taken a toll on his health due to the "constant stress," saying that he suffered liver problems that forced him to overhaul his diet. "It’s unpleasant, of course, when the entire government is working against you," he said.